Todd Monken’s plays are working. Here’s why and what it means for the Bucs. TAMPA — Todd Monken is calling the offensive plays for the Bucs. More importantly, they are working.Fifty-six points scored in two preseason games is evidence of that.Will it continue?The scoring might, but there is no plan for head coach Dirk Koetter to give up the play-calling this season.That said, Monken has made the most of his opportunity. First, he was asked to give up his other duties as the wide receivers coach to concentrate full time on his job as offensive coordinator.RELATED: More Bucs coverageSecondly, he became another voice in the helmet of Bucs quarterbacks Jameis Winston and Ryan Fitzpatrick, which at least allows for a change to be made at any point during the regular season if Koetter ever decided to go that route. 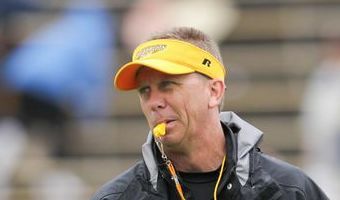 "I'm grateful to have the opportunity,'' Monken said. "It started in the off-season with being able to call it out here. The quarterbacks hearing your voice, getting used to calling plays. Then the next step is how you do in two-minute. So now you've … [Read more...] about Todd Monken’s plays are working. Here’s why and what it means for the Bucs.